Bird watching and walking in the nature is one of the best ways to relax and enjoy the beautiful Lappish nature. You may see magnifcent Elks observing you when you walk on the duckboards towards to the most popular bird watching tower in Pelkosenniemi. 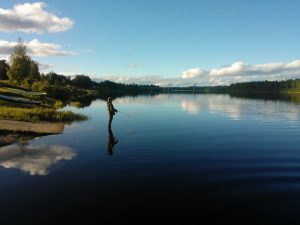 After enjoying wildlife observation, we head to do fishing with a rod by the river of Kemijoki. Around campfre we enjoy beautiful viewsof the river and delicious roasted sausages and traditional black pot of coffee. If you are lucky we may roast your catch.